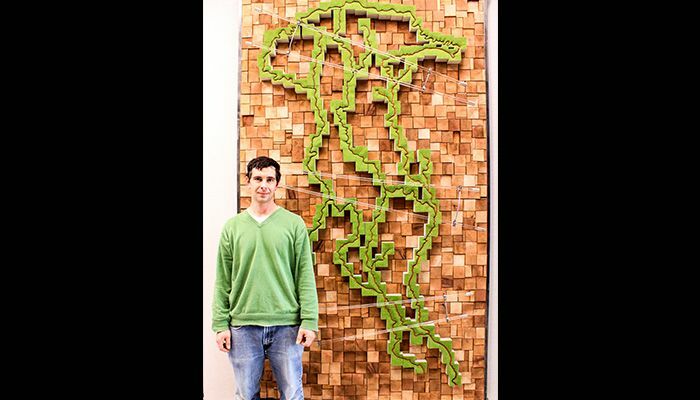 Jonathan Pellitteri's “Downstream” sculpture depicts the rivers in the Carolinas and hangs on the 21st floor of Duke Energy’s headquarters in Raleigh. Keowee River in South Carolina. 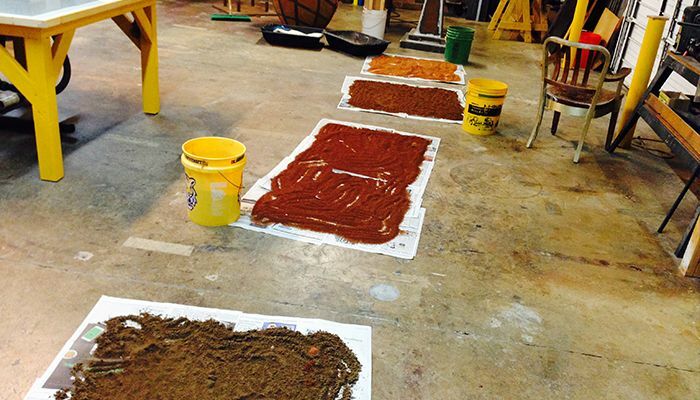 Soil samples arranged on artist's studio floor are from the Keowee, Catawba, and Yadkin rivers. 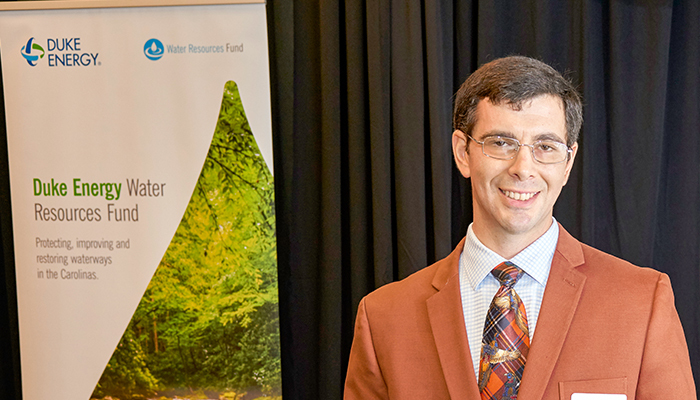 When Jonathan Pellitteri was commissioned to create artwork for Duke Energy’s Water Resources Fund, he turned to the rivers of the Carolinas for inspiration. Pellitteri drove from his home in Davidson, N.C., to the banks of the Cape Fear, Catawba-Wateree, Dan, Keowee-Toxaway, Neuse and Yadkin-Pee Dee rivers. 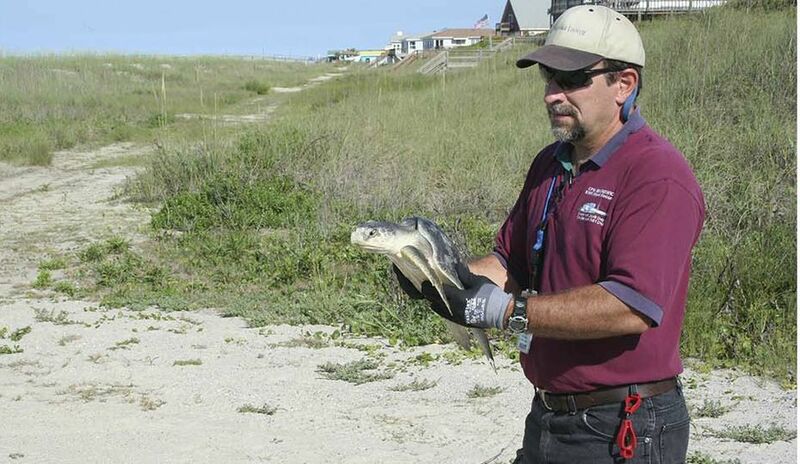 At each shore, he scooped water into a plastic jug and shoveled dirt into a large bucket. Back at his studio in Charlotte’s NoDa neighborhood, he incorporated the samples into his art. 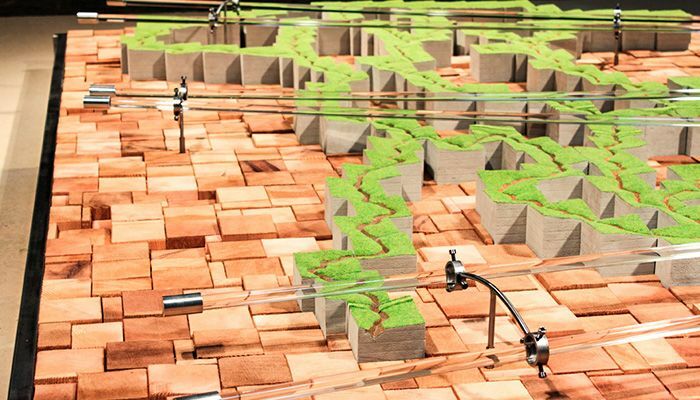 “Downstream” now hangs on the 21st floor of Duke Energy’s headquarters in Raleigh, a stunning interpretation of six river systems that the company manages under a Federal Energy Regulatory Commission (FERC) license and that are the focus of the Water Resources Fund. Pellitteri carved the flow of each river bed into the top of 150 connecting blocks and lined the beds with soil dug from the rivers, varying from a dull gray silt to vibrant red clay. Acrylic tubing containing some of the water he collected crisscrosses the piece. Each time a nonprofit receives a grant from the fund, it also receives a matching one-block segment of river. 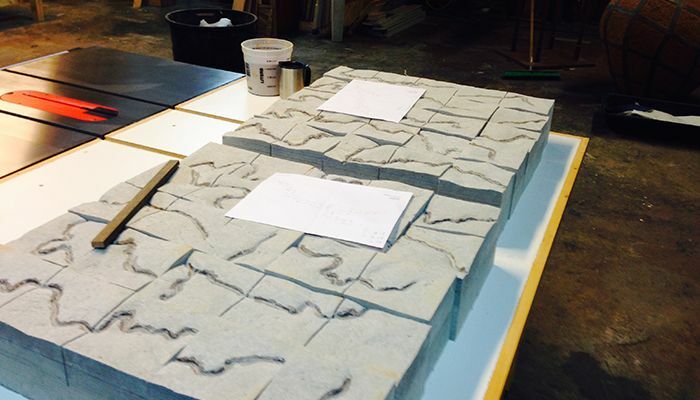 Like the blocks Pellitteri used in “Downstream,” the individual blocks are fashioned from fiber wall board made from compressed recycled paper. Each side is inset with a vial of water from different rivers. On top is the topography of that section of river with the riverbed again lined with soil. 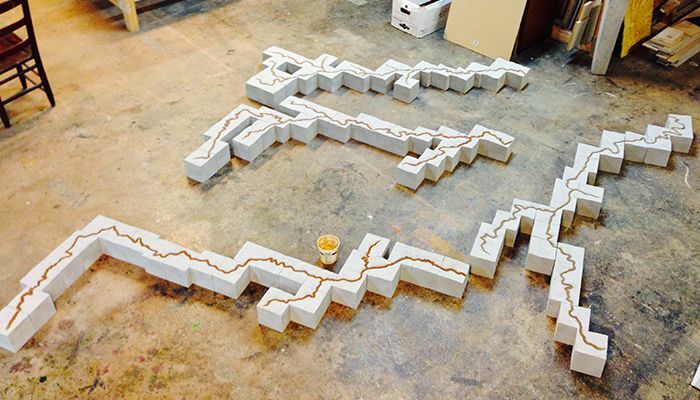 Davidson, N.C., artist Jonathan Pellitteri created a sculpture of the Catawba River. 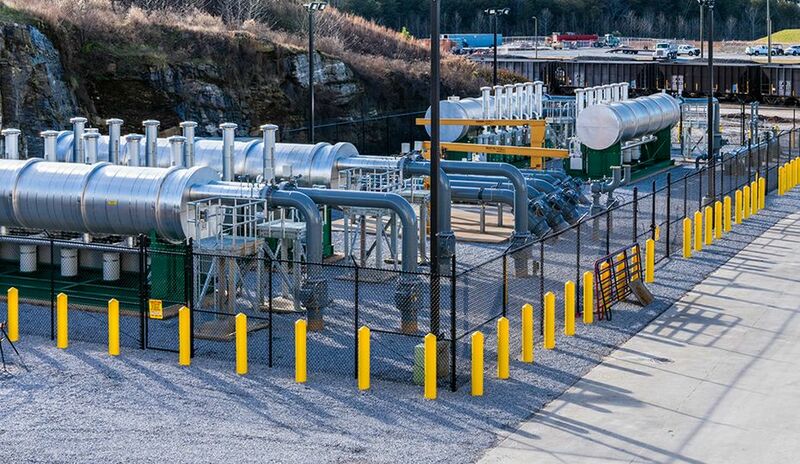 That’s also the message of the Water Resources Fund, created in 2014 after a storm water pipe broke, releasing coal ash from the company’s Dan River Steam Station into that river. 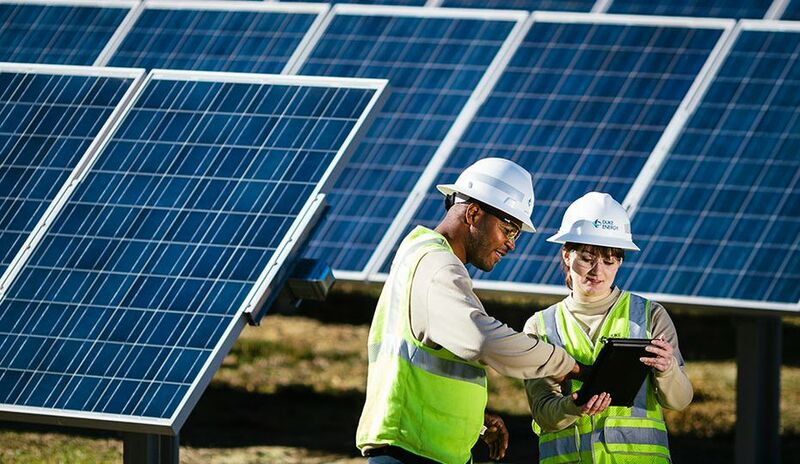 The $10 million fund provides grants for nonprofits and local governments to improve water quality, promote fish and wildlife habitat and increase public access – with $1.5 million earmarked for the Dan River basin and $500,000 for a park in Danville, Va., where clean-up efforts were staged. As of December, the fund had awarded $5 million for 59 projects. He began incorporating water into his sculptures. 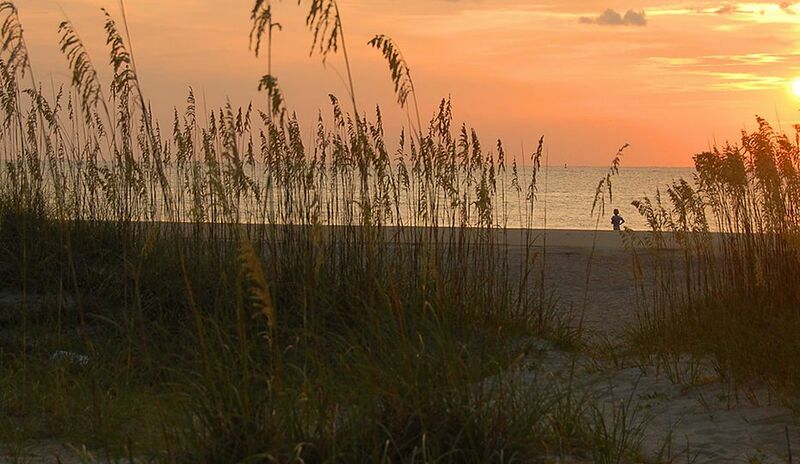 Despite leaving the coast in 2013 when his wife took a job in Mooresville, N.C., Pellitteri still felt drawn to the water. 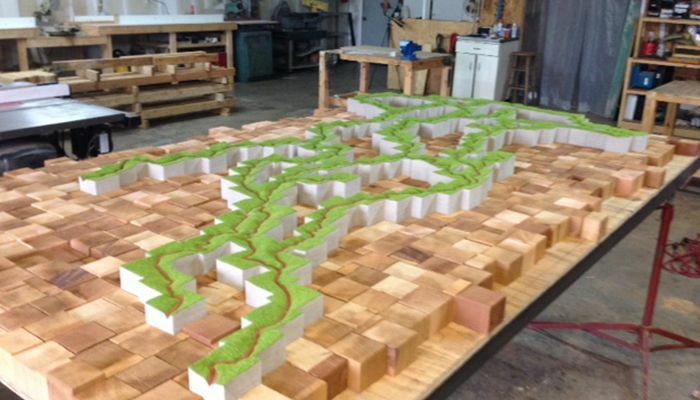 He created a piece about the Catawba River for the Arts & Science Council of Charlotte and Mecklenburg County, and that’s how Duke Energy learned about his work. 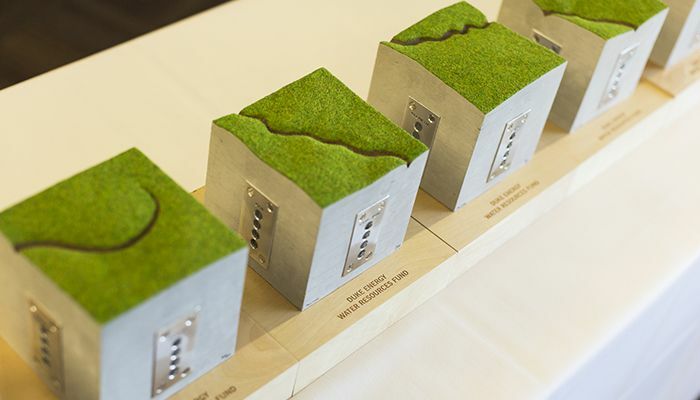 As Duke continues to award grants from its Water Resources Fund, more nonprofits and local governments throughout North and South Carolina will receive individual blocks that Pellitteri designed. 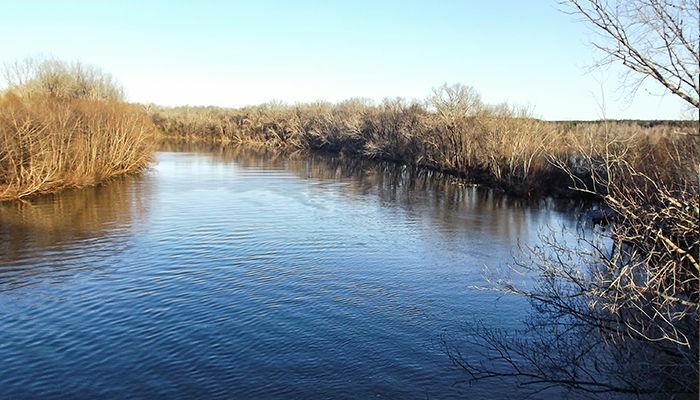 “We try and match each organization with a piece of their waterway,” Pellitteri said. One of his sculptured blocks containing a bit of the Dan River went to Halifax, Va., which is using its grant to improve river access. 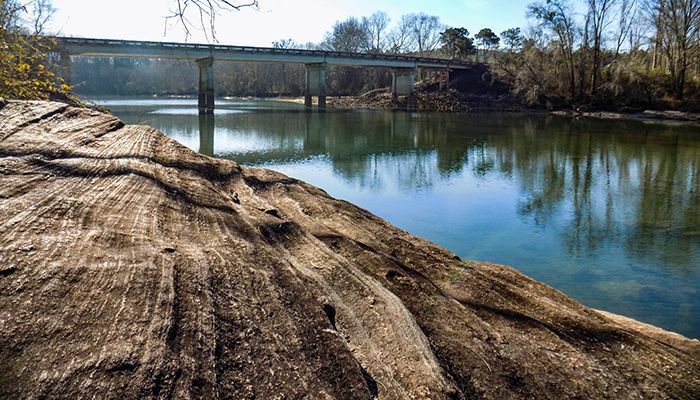 A block with soil and water from the Cape Fear went to Elizabethtown, which will construct a boardwalk. 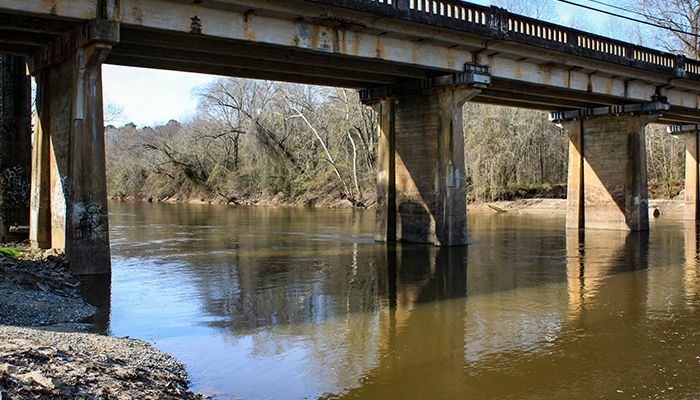 A bit of the Wateree went to the Lake Wateree Association, which will track algae growth.